Small, lovely and not over the top. 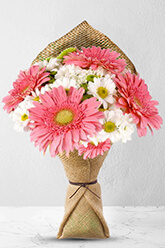 These pink Gerberas mixed with white Chrysanthemums make a beautiful little gift for anyone you care for.Vase not included however; if you wish to add to the excitement of receiving these beautiful flowers and elaborate your order, we recommend adding a Premium Vase. My mother was delighted with the flowers. They were delivered to her on time and were beautiful. Support team was excellent. I needed a special 'thank you ' gift for my aunt who lives interstate. Great to be able to choose what I want online and have confidence delivery will take place on time. Thank you. The delivery arrived on time and the flowers looked great! So far, I have received positive feedback from the recipient of the flowers I have bought. I sent flowers to my grand daughter, she loved them. The service was great. I would not hesitate and use zFlowers.com again.